The US dollar is firming to its best level in two weeks on better-than-expected industrial figures and improved US-China trade relations. Greenback investors are shrugging off warnings of sluggish global economic growth and weak Chinese economic data. Heading into 2019, traders anticipated a bearish trend, but the currency has performed modestly well against a basket of currencies. According to the Federal Reserve, US manufacturing output climbed 1.1% in December, the biggest gain in 10 months. The soaring production numbers were supported by construction supplies, automobiles, materials, and business supplies. On the index front, the Institute for Supply Management (ISM) recorded expansion for the 116th straight month, bringing the 12-month average to 58.8 – anything 50 indicates expansion. The Customers’ Inventories Index clocked in at 41.7 last month, which is the 27th consecutive month of low customer inventory. Because of ballooning manufacturing output, there is a strong hiring push to keep up with the momentum. The Bureau of Labor Statistics (BLS) reported that the sector created 284,000 jobs in 2018, the highest annual gain since 1997. However, approximately 500,000 positions have still gone unfilled, adding to the concerns that the projected shortage of two million skilled workers by 2025 will come true. The real estate industry could not post stellar numbers. The National Association of Realtors (NAR) announced on Tuesday that existing-home sales were a seasonally-adjusted annual rate of 4.99 million in December, the lowest since November 2015. Overall sales were down 6.4% last month, and 10.3% lower than the same time a year ago. On Monday, the Chinese government announced that its official economic growth reached 6.6% in 2018, the slowest pace in 28 years. Fourth-quarter gross domestic product (GDP) growth was 6.4%. When it comes to technical data, industrial output rose 5.7%, retail sales soared 8.2%, real estate investment climbed 8.2%, and property sales edged up 1.3%. The US stock market did not react on Monday because exchanges were closed for the Martin Luther King Jr. holiday. When the markets opened on Tuesday, the leading indexes plunged as traders fear Beijing’s lackluster growth threaten the global economy. The International Monetary Fund (IMF) contributed to these worries, warning in a report that the global economic expansion is slowing down, causing it to cut its growth forecasts. 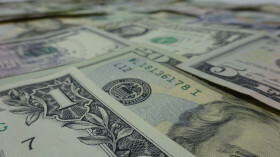 The USD/CAD currency pair rose 0.29% to 1.3331, from an opening of 1.3293, at 16:10 GMT on Tuesday. The EUR/USD dipped 0.02% to 1.1365, unchanged from its opening.